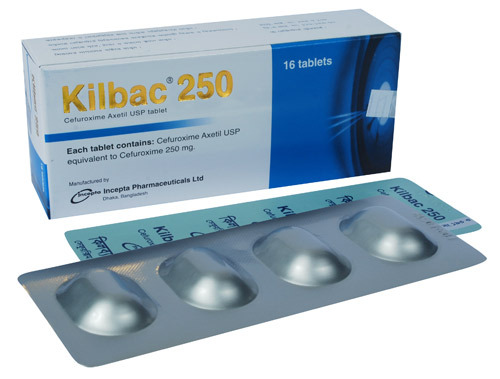 Kilbac 125: Each film coated tablet contains Cefuroxime Axetil USP equivalent to Cefuroxime 125 mg.
Kilbac 250: Each film coated tablet contains Cefuroxime Axetil USP equivalent to Cefuroxime 250 mg.
Kilbac 500: Each film coated tablet contains Cefuroxime Axetil USP equivalent to Cefuroxime 500 mg.
Kilbac dry powder for suspension: After reconstitution according to direction, each 5 ml suspension contains Cefuroxime Axetil USP equivalent to Cefuroxime 125 mg.
Kilbac DS dry powder for suspension: After reconstitution according to direction, each 5 ml suspension contains Cefuroxime Axetil USP equivalent to Cefuroxime 250 mg.
Kilbac 250 IM/IV injection: Each vial contains Cefuroxime sodium USP sterile powder equivalent to Cefuroxime 250 mg.
Kilbac 750 IM/IV injection: Each vial contains Cefuroxime sodium USP sterile powder equivalent to Cefuroxime 750 mg.
Kilbac 1.5 IV injection: Each vial contains Cefuroxime sodium USP sterile powder equivalent to Cefuroxime 1.5 gm. 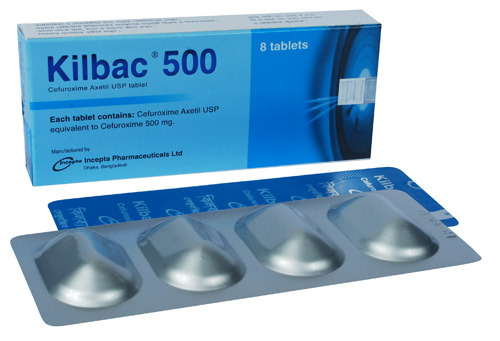 Cefuroxime is one of the bactericidal second generation cephalosporin antibiotic which is active against a wide range of Gram-positive and Gram-negative susceptible organisms including many beta-lactamase producing strains. 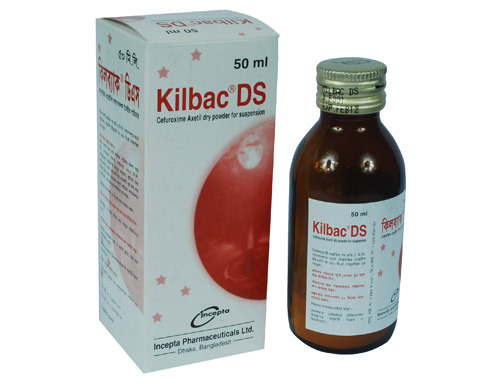 It is indicated for the treatment of infections caused by sensitive bacteria. - Acute bacterial otitis media caused by Streptococcus pneumoniae, Haemophilus influenzae (including beta lactamase-producing strains), Moraxella Catarrhalis (including beta-lactamase-producing strains) or Streptococcus pyogenes. - Lower respiratory tract infections including pneumoniae, caused by Streptococcus pneumoniae, Haemophilus influenzae (including beta lactamase-producing strains), Klebsiella spp., Staphylococcus aureus (penicillinase- and non-penicillinase-producing strains), Streptococcus pyogenes, Escherichia coli. - Acute bacterial exacerbations of chronic bronchitis and secondary bacterial infections of acute bronchitis caused by Streptococcus penumoniae, Haemophilus influenzae (beta-lactamase negative strains), or Haemophilus parainfluenzae (beta-lactamase negative strains). - Skin and Skin-Structure Infections caused by Staphylococcus aureus (penicillinase- and non-penicillinase-producing strains), Streptococcus pyogenes, Escherichia coli, Klebsiella spp., and Enterobacter spp. - Urinary tract infections caused by Escherichia coli or Klebsiella pneumoniae. - Bone and Joint Infections caused by Staphylococcus aureus (penicillinase- and non-penicillinase-producing strains). - Gonorrhea : Uncomplicated and disseminated gonococcal infections due to Neiseria gonorrhoeae (penicillinase- and non-penicillinase-producing strains) in both males and females. - Early Lyme disease (erythema migrans) caused by Borrelia burgdorferi. - Septicemia caused by Staphylococcus aureus (penicillinase- and non-penicillinase-producing strains), Streptococcus pneumoniae, Escherichia coli, Haemophilus influenzae (including ampicillin-resistant strains), and Klebsiella spp. - Meningitis caused by Streptococcus pneumoniae, Haemophilus influenzae (including ampicillin-resistant strains), Neisseira menintitidis, and Staphylococcus aureus (penicillinase- and non-penicillinase-producing strains). - Surgical Prophylaxis: Prophylaxis against infections in abdominal, pelvic, orthopedic, cardiac, pulmonary, esophageal and vascular surgery where there is increased risk for infection. 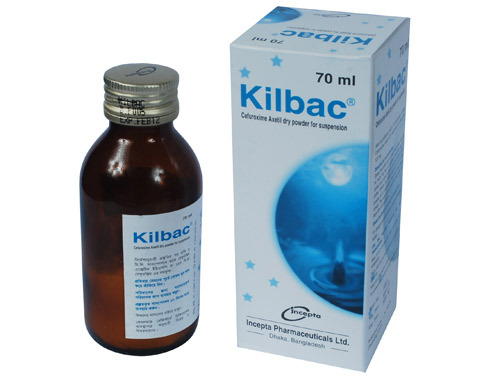 Adult: 750 mg three times daily by IM or IV injection. In severe infections, dose can be increased upto 1.5 gm three times daily by IV injection. The frequency may be increased to four times daily, if necessary, giving total daily doses of 3 to 6 gms. Children (above 3 months of age): 30 - 100 mg/kg/day given in 3 or 4 equally divided doses. A dose of 60mg/kg/day is appropriate for most infections. Neonate: 30 - 100 mg/kg/day given in 2 or 3 equally divided doses. 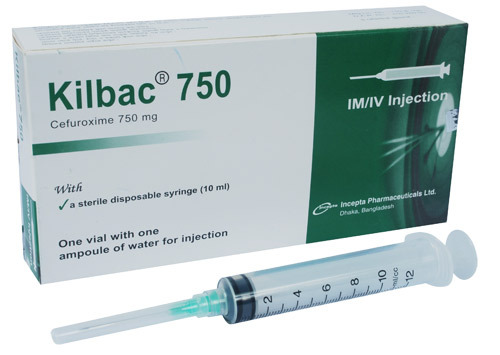 Surgical prophylaxis: 1.5 gm by IV injection at induction of anaesthesia; up to 3 further doses of 750 mg may be given by IV/IM injection every 8 hours for high risk procedures. Pneumonia: 1.5 gm IV injection twice daily for 2-3 days, followed by 500 mg twice daily (oral) for 7-10 days. In Gonorrhoea: Adult: 1.5g as a single dose (as 2 x 750mg injections intramuscularly with different sites, e.g. each buttock). In Meningitis: Adults: 3gm IV injection three times daily. 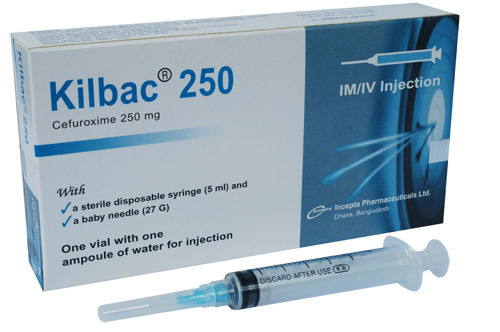 Children (above 3 months of age): 200-240 mg/kg/day by IV injection in 3 or 4 divided doses reduced to 100 mg/kg/day after 3 days or on clinical improvement. Neonate: 100 mg/kg/day by IV injection reduced to 50 mg /kg/day. 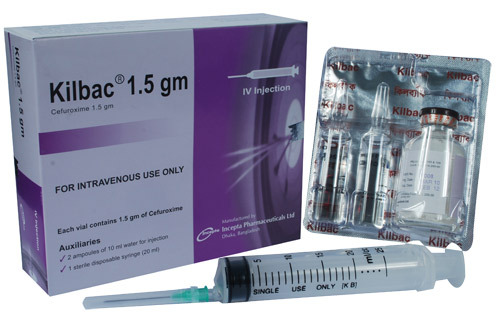 In bone and joint infections: Adult: 1.5 gm IV injection four times daily. Children (above 3 months of age): 150 mg/kg/day (not to exceed the maximum adult dose) in equally divided doses every 8 hours. * Since Cefuroxime is dialyzable, patients on hemodialysis should be given a further dose at the end of the dialysis. In paediatric patients with renal insufficiency, the frequency of dosing should be modified consistent with the recommendations for adults. Generally Cefuroxime is well tolerated. However, a few side effects like nausea, vomiting, diarrhea, abdominal discomfort or pain may occur. As with other broad-spectrum antibiotics, prolonged administration of Cefuroxime may result in overgrowth of nonsusceptible microorganisms. Rarely (<0.2%) renal dysfunction, anaphylaxis, angioedema, pruritis, rash and serum sickness like urticaria may appear. Cefuroxime should be given with care to patients receiving concurrent treatment with potent diuretics & who have history of colitis. Pregnancy: While all antibiotics should be avoided in the first trimester if possible. 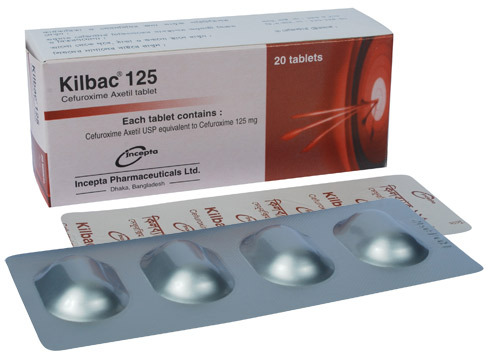 However, Cefuroxime has been safely used in later pregnancy to treat urinary and other infections.